Milk thistle is one of the best conditioner of liver that nature gave us. It also protects the body and it is hard for any other product to be compared to it. In our article, learn how to make tea from its seeds, and more products that this exceptional plants gives. Milk thistle belongs to the family of Asteraceae (aster). Hardy and herbaceous, her root is fleshy, spindle-shaped, and the stalks are upright and can get higher than 2.5 meters. The leaves are quite large, sharply toothed, dark green are the colours with dangerous spines that secrete poison. On the surface the leaf has a waxy coating. At the very top of the branched stems Savoy flowers are formed and their size is 5 to 8 cm. They are purple in colour, less often white, while the outer petals end in a very sharp spines. Milk thistle has an elongated oval fruit, long 8 -9 mm. Veil of ripe fruit is brown with light freckles and yellow ring. The fruit is 2-5 percent flavonoids, and on the fruit there are more white flowers than pink ones. They contain valuable fatty oils. Vegetation lasts from 110-140 days. Milk thistle grows wild in the wider Mediterranean, in all regions with warm climates. It is grown successfully in the world. It grows best on the dunghill, which are heaped in humus and other rich terrain. When does the plant blossoms? The time of flowering is at 6th of 7th month (June and July) 80 to 90 days after emergence, the flowers start to appear. Since it comes from warmer climates, the fruit of this plant reduces if exposed to cold temperatures for a long time or heavier precipitation. If the soil is better and richer, this plant will bear more fruit than usual but usually it thrives everywhere. As a fairly hardy plant it fits well in crop rotation, and since there is a lot of seed dropout before harvest and during it, it is not suitable as preceding crop. The seeds of milk thistle when spread throughout the land appear next year like a weed in the new crop. Milk thistle must always be sown at the very beginning of spring (March), space in row spacing should be at least 70 cm, and in one row we plant about 30 grains, at a depth of two and a half to three centimetres. Milk thistle is harvested when all the leaves become dry, and its primary flowers are not white. This often happens at the end of the year in the 8th and 9th month (August and September). Milk thistle contains valuable flavonoid silymarin that is very effective - more below. In medicinal purposes you can use milk thistle seeds and leaves. In folk medicine the best known is milk thistle for the liver, gallbladder and pancreas, and preparations based on this plant have been used since ancient times, as evidenced by numerous records of old herbalist. Laboratory analysis led to the fact that the thistle is nothing but "rehabilitated weeds" to be quite accurate. In addition, milk thistle plant as a medicine is mentioned since ancient times, as it was already recommended by Ancient Greek physician Dioscorides. In the past roots and leaves were cooked to make medicinal drinks for fevers, stem against dropsy and for the absence of menstruation. The latest laboratory analysis found that the seeds of milk thistle are active constituents containing valuable essential oils, like amino acids and biogenic amines. They are very important to us because they act on our vegetative nervous system and at the same time balance the organic metabolism and stimulate our living cells in liver. More precisely, they protect it and they are very useful for patients with hepatitis, as well as in people with diagnosed liver cirrhosis (hardening of the liver damage of aldehyde, etc.). 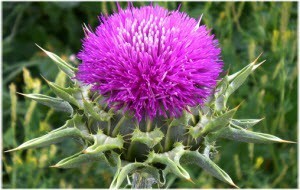 Milk thistle helps with heart problems, stops bleeding, it is recommended even for prostate cancer. It helps the nursing mothers for better milk production, because it works like the hormone estrogen, helps to treat psoriasis, inflammatory bowel disease, in various kidney diseases, perfectly balances the levels of cholesterol, is effective with allergies, migraines, low pressure and dizziness, asthma, persistent and whooping cough, sickness etc. One small teaspoon of dried herb pour with a full cup of boiling water, and then cover, remove from heat and let it rest for 10 to 8 minutes. After this period, strain it and do not drink sweetened and always do it before eating. You can use it directly before the main meal - up to three times during the day. Drink it slowly in measured small sips if you have mentioned health ailments or diseases. In German pharmacology mostly used is tincture from milk thistle, which is obtained from ripe fruits and seeds, while Americans used the plant in flowers. In folk medicine commonly used are leaves from Cardui Mariae Folium, and in some regions for medicinal purposes green tea, that is the whole plant is used. Where to buy milk thistle tea? You can obtain a dry extract which is prepared from its fruit or you can buy tablets from milk thistle (coated tablets), more recently in the stores with healthy food, as well as other herbal pharmacies. On the shelves you can find and increasingly popular tea from the seeds which is an extraordinary detoxifier and conditioner of liver. Soon we can expect for this product to appear online, via the Internet, this will make the order very easy. We still did not notice this tea being advertised on the Internet, but be sure to expect it in the following period. Earlier, the milk thistle could be found only at the famous herbalist stores, while today it is natural treatment that can be found in the aforementioned stores.